The team behind the global phenomenon "The Da Vinci Code" returns for the highly anticipated "Angels & Demons," based upon the bestselling novel by Dan Brown. Tom Hanks reprises his role as Harvard religious expert Robert Langdon, who once again finds that forces with ancient roots are willing to stop at nothing, even murder, to advance their goals. Ron Howard again directs the film, which is produced by Brian Grazer, Ron Howard, and John Calley. The screenplay is by David Koepp and Akiva Goldsman. Download Angels & Demons in Digital HD from the iTunes store. Angels & Demons images are © Columbia Pictures. All Rights Reserved. 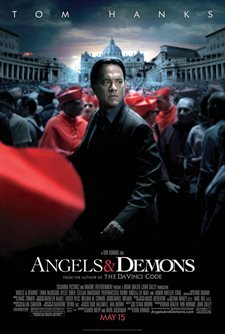 Shortly after 2006's The Da Vinci Code became a commercial success, Imagine Entertainment began work on the prequel to that novel, Angels and Demons. Due to the writer's strike, it took three years to get the movie to the big screen. Was it worth the three year wait? Dan Brown wrote Angels and Demons before The Da Vinci Code, and it was a prequel to that wildly successful novel. Ron Howard, however, decided that it would work better as a sequel to the book, and as such, they drop the occasional hints to the previous movie. But you don't need to know anything about the previous movie to relate to the events of Angels and Demons. The movie begins some time after the events of The Da Vinci Code, starting with the death of the Pope, followed by the theft of antimatter from CERN. Tom Hanks, as Robert Langdon, is called to duty once more, this time by a reluctant entity – Vatican City. Robert agrees to help since he wrote a book on the subject that is referenced by the Vatican. After the first few minutes, the movie becomes very fast-paced, with very little slowdowns. I'm not sure if this was in response to critics of The Da Vinci Code, but when you consider the structure of the preceding movie, Angels and Demons fails to live up to expectations. By making the movie very fast paced, it becomes a pseudo-thriller rather than a mystery/treasure hunt movie, which was The Da Vinci Code's greatest strength. (along with the National Treasure series). 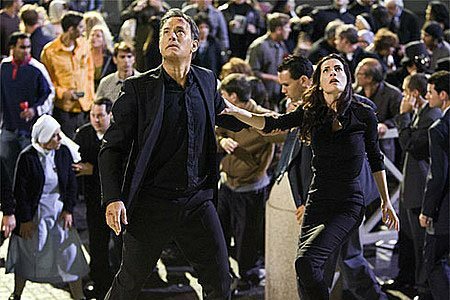 At times it makes the mystery part secondary, and too easy, while becoming a quick and cheap copy of the 24 television series. (The heroes have an hour to solve each part of the mystery). The story has changed from the novel, and I'm not sure if it was for the best. It seems to be a little too convenient for such an intricate plot to be hatched and implemented over such a small little thing, when the novel explained various other reasons, all of which were ignored in the movie. Small little things were also removed, such as the background of the film's mostly unseen villain, which I think is another vital and small part of the story. One major ending plot in the novel is completely removed from the movie, which takes away from the whole development of the story. The story's shortcomings are one thing. At times the cinematography enjoys making most of the scene out of focus for no apparent reason and entirely too many times for the movie. However, the actors seemed to focus a little more on trying to make this an entertaining movie. Tom Hanks does an excellent job with the script he was given, and Ewan Macgregor is outstanding in his role as the Camerlengo. Most of the other characters are just small additions to the plot, but all did decent work. To conclude, I just wasn't taken with this movie. It fails to achieve on many levels, but mostly in regards to the story and script. Too much was removed or altered from the novel and the result shows from changing the movie from a detective/mystery to a time-constrained pseudo-action thriller wannabe film. Angels & Demons images © Columbia Pictures. All Rights Reserved.